To announce the signing of the Brest-Litovsk armistice, five photographs were chosen to feature in the Russian and German newspapers. In the above photograph, which appeared in particular in French newspapers Le Miroir and Excelsior, twelve people are identified by a number, as opposed to seventeen in the Russian and German newspapers. 1- Borisovich Kamenev (1883-1936), first Russian delegate; 2- Adolf Abramovitch Joffé (1883-1927), president of the Russian delegation; 3- Ms Biecenko (Bizenko), Russian. The only woman visible on all the armistices and peace treaties signed during the First World War; 4- Admiral Vassily Mikhailich Altfater or Altvater (1883-1919), Russian; 5- Captain Lipsky, Russian; 6- Lev Mikhailovich Karakhan (1889-1937), Russian; 7- John Gugovitch Fokke, Russian; 8- Ismail Hakki Pasha (1862-1918), Turkish Ambassador to Berlin; 9- Kajetan Mérey von Kapos-Mere (1861-1931), Austro-Hungarian Ambassador; 10- Prince Leopold of Bavaria (1846-1930), President of the deliberations, commander of operations on the Eastern Front; 11- Major General Max Hoffmann (1869-1927), German military officer and diplomat; 12- Colonel Gawtschef, Bulgarian. Seven armistices were signed between 5 December 1917 and 13 November 1918. The delegates engaged the power they represented by signing a convention establishing a number of clauses relating to the cessation of fighting on land, at sea and in the air, the withdrawal of troops from certain territories, the deposit of weapons and war materials, financial compensation or compensation, the loss or gain of territories, the boundary of borders, etc. Some of these terms were to be enforced immediately after the signing of a treaty, while others were negotiated as part of a Peace Treaty that would have to be ratified thereafter. Since entering the war in August 1914, Russia, already facing severe internal difficulties, had piled up the military defeats, heavy losses, a falling economy, etc. In February 1917, a revolution broke out and overturned the Tsarist regime. In October of the same year, the Bolsheviks took the power. On 26 October 1917, Lenin announced the abolition of secret diplomacy and proposed to all warring countries that talks be held “with a view to a fair and democratic peace, immediately, without annexations and without compensation”. 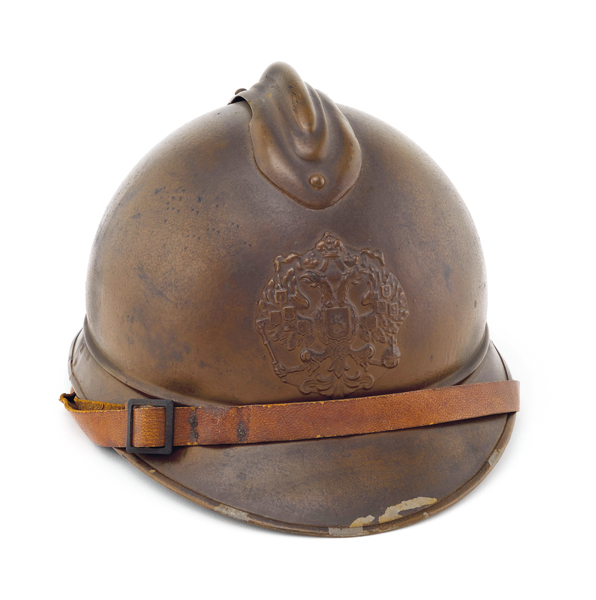 Germany accepted, and on 26 November 1917 a cease-fire was concluded between Germany and Russia. The armistice was signed on 5 December 1917 and was to take effect on 15 December 1917 for a period of two months. It was concluded between the central powers (coalition made up of the German Empire, the Austro-Hungarian Empire, the Ottoman Empire and the Kingdom of Bulgaria) and the Bolshevik power resulting from the October Revolution. In the newspapers of the day, the armistice bears the name of the place where it was signed, Brest-Litovsk. The Peace Treaty signed in March 1918 was also signed in Brest-Litovsk, which sometimes leads to confusion between the two events. 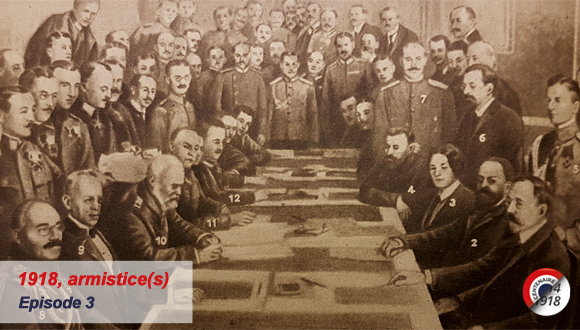 Peace talks were initiated, but did not result in an agreement, and the armistice was not extended. From 17 February 1918, the German, Austro-Hungarian and Ottoman units resumed their advance within Russian territory. 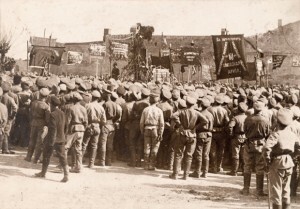 On 3 March 1918, the Bolshevik Russian Republic, which was experiencing strong internal dissensions and did not have the means to take on its opponents, was forced to sign the Brest-Litovsk Treaty, in what Lenin described to be the infamous peace. This put an end to the fighting on the Eastern Front. 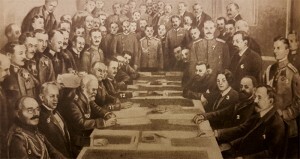 The Soviets annulled the Brest-Litovsk Treaty on 13 November 1918.